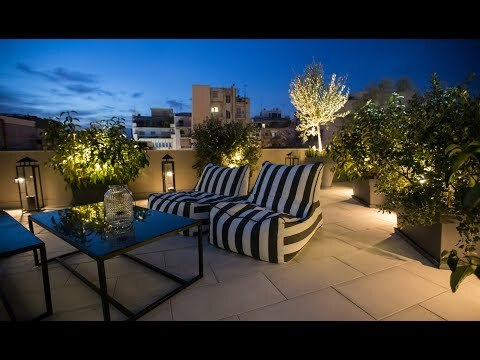 The suites of HEART OF ATHENS are situated in one of the most central points of the capital and they are distinguished for their perfect architectural design, minimalist decoration, high quality services and pleasantly cosy ambience. The lavish suites of high aesthetics occupy the ground floor, the 1st and the 2nd floor of a historic building, which was lovingly renovated to harmoniously integrate with the surrounding area. Each suite may accommodate 2-5 guests, and they are the perfect choice for accommodation since they are in the centre of commercial and social life, they are served by metro and other public transport means and they provide direct access to the most significant sights of Athens. Designed in minimal architectural style. Recently renovated building located on Nika Louka Street consists of 3 luxurious suites that may be rented separately or together. Cosmopolitan nights with a view of the Acropolis & Lycabettus Hill. Our luxurious suites are ideal for any kind of social event, either for a small private gathering or an impressive party with friends.